Mission and Mercy – where do we start? Part 2 – In Public! | "Northern Crossings"
Mission and Mercy – where do we start? Part 2 – In Public! There is a lot of talk today about the privacy and personal nature of faith. Smarmy politicians will tell you that they are Christian but don’t want to” push their personal beliefs of others”. They usually say this when speaking of abortion, but of course they don’t mind pushing their personal opinions on us when it comes to health care, guns, or cigarettes, or global warming. We hear the same nonsense that we should be careful of how we do mission work especially in areas that prohibit Christianity. Oswald Beyer has a different take on that. 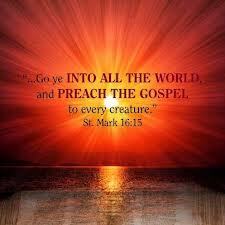 The gospel is public and, whether we wish it or not, it will and must be proclaimed in public throughout the world—and not only to all people but also to the “whole creation” (Mk 16:15). This all encompassing public character of the outer breadth and extent of world mission corresponds exactly to the inner depth and intensity with which we praise of God and love him with all our heart, and with all our soul, and with all our mind. The breadth and depth of the universal public is given with God’s uniqueness (Deut 6:4f.) and the first commandment (Ex 20:2f.). PreviousMission and Mercy – where do we start? NextMercy and Mission – we are witnesses.